My name is Kathryn Davies. I am a Personal Assistant at Challenge Community Services, Maitland. My role is a jack-of-all-trades position really. In any moment I might be answering mail, doing data entry, writing blogs, collating data for board reports, organising meeting agendas or supervising our Transition To Work (TTW) participants. Essentially I’m the office manager of our back of house. I started working with Challenge three years ago. Here was an organisation that was making a difference in the disability sector and was a not-for-profit. Money wasn’t the driving force. Also I have young children so the job flexibility was attractive. I started permanent part time and was able to pick and choose my working days around childcare. Now I’m full time but the flexibility is still there. I can take time off in lieu, get rostered days off and am able to put aside pay to increase my annual leave. Challenge is all about helping people in their daily life. It’s about giving people more opportunities and helping them voice what they want to do. The young woman I supervise as part of our transition to work program (TTW) is a prime example of this approach. This program is all about assisting young school leavers with a disability to develop skills and experiences so they can find a career. 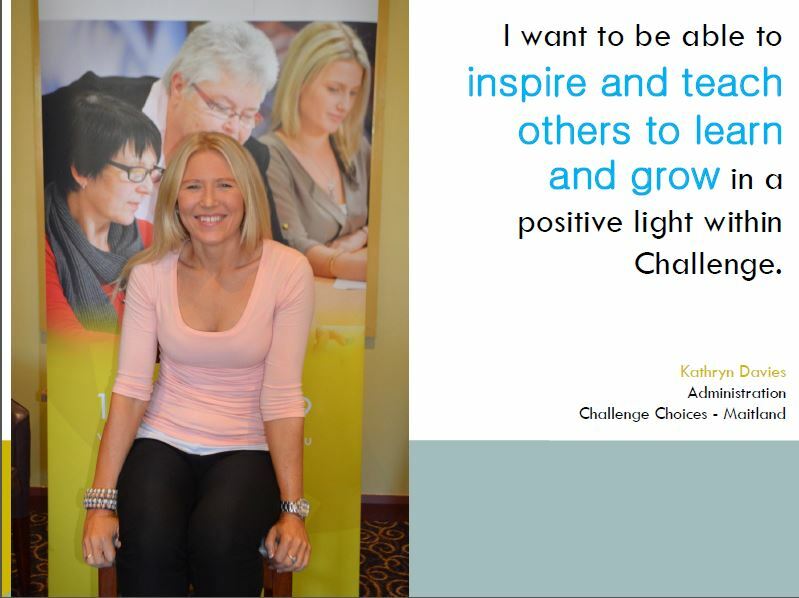 When this woman originally started at Challenge she was shy and not very confident. In the beginning a TTW worker stayed with her during the workday and helped her build both her skills and confidence. Now? She is just beaming. She arrives on her one day a week with set tasks and works independently. During her time she has completed a Cert II in hospitality, gotten an RSA and is now out there looking for work. Her productivity is through the roof. It’s such a great thing to see a young individual come leaps and bounds in such a short time. Things like work and being out there in the community are so important. It helps people feel needed. It contributes to their identity. It’s about having a purpose to get out of bed and be active. If you feel that you’re needed and that you’re contributing it just increases your well-being and improves your outlook on life. 2015 is the first year Challenge has participated in the projectABLE program. I want young people to know that with the implementation of the National Disability Insurance Scheme (NDIS), the sky’s the limit. The sector is going to be less tied to 9-5 work hours. Rather people with disabilities are seeking like-minded individuals to spend time with. This means that the sector is the place to follow your passions, like art, music, travel and to share them with others. People with disabilities will be able to select the support that best suits them. Young people can still go off to uni and study on their set days but work in the sector on weekends and evenings. Listening to a concert, a trip to the pub or simply going to a movie. Work in the sector will look more like the activities people with disabilities are interested in. This doesn’t mean there aren’t concerns about the NDIS. As someone with experience in running the administrative side of a service provider, I wonder how smaller organisations will adapt to the new system. But I’m excited that under the NDIS people with disabilities have the freedom to say, “Hey, this is what I want. You guys are there to assist me.” At the end of the day it’s about being positive, proactive and ensuring we get the best outcomes for people with disability. So I say bring it on. WANT TO HELP OTHERS CONNECT WITH A SENSE OF PURPOSE? START WITH A PROJECT-ABLE WORKSHOP. CHALLENGE COMMUNITY SERVICES ARE HOSTING WORKSHOPS THROUGHOUT TERM 3.